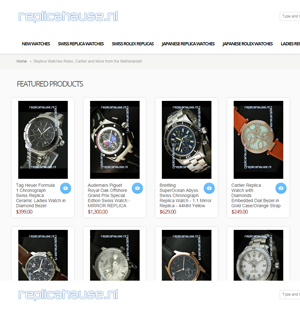 If you were thinking of getting the best replica watches from the Netherlands then ReplicaHause.nl might just be the perfect place for you. With a diverse imitation timepieces collection and very affordable prices, this online store tempts you to buy the latest replica designer watches. Check it out! 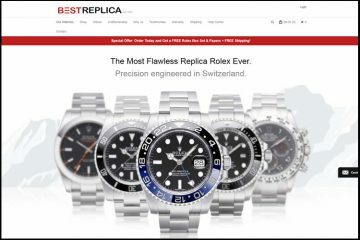 Replicahause.nl is one of the most plain looking online replica stores I have seen lately. Usually, the whole appearance of a website is constructed around a large center banner that shows some beautiful products. Not this store! This one gets right to the point. It just has a top side simple black and white menu and the featured products. The only aesthetic embellishment is a right side banner , also very simple looking, that shows a blue arrow, black text mentioning the available discounts and a small and plain picture of a rose gold Rolex DateJust. Clearly, the website isn’t too appealing, but it is very easy to use. The color scheme is white and blue with black text. Any inexperience online shopper is able to purchase a replica from this store in a few clicks. To start you only need to select one of the categories listed in the menu. The menu has some interesting buttons named: “Swiss Replica Watches”, “Swiss Rolex Watches”, “Japanese Replica Watches”, “Japanese Rolex Watches” and “Ladies Replicas”. By rolling the cursor over one of these buttons, you see how a large list of available brands appears. You can take it from here! Just click on the brand that interests you and start shopping. The collection is pretty impressive. It includes over 40 brands, some of the most loved watch companies around the globe. Only the Rolex brand is divided into collections. The other brands are not organized, but this is simply because they do not include that many models. The larger brand categories such as Omega, Breitling or Panerai list only about one hundred items. The even smaller ones have only 10 or 20 designs. This makes it easier for us to browse the replica watches and makes it unnecessary to include an Advanced Search option. You can sort the products by price and frankly you do not need more to find the desired watch in no time. The prices are for any type of budget. Depending on the quality you are looking to buy, you can choose between the Japanese movement watches and the Swiss movement watches. The replicas equipped with a Japanese mechanism cost about $150-$250. The ones that come with a Swiss made mechanism cost about $300-$600. The descriptions for these replica watches are very well made. These have very detailed information regarding the functions, materials and performance of these beautiful imitation timepieces. It even includes the warranty time of 6 months- both for Swiss and Japanese watches. Replicahause.nl can accept all major credit card types such as Visa, Mastercard, Visa electron and American Express. It can also process Western Union and Money Gram payments. I find these supported payment methods as very reliable and diverse, and also a good indicator of the company’s professionalism. Interesting enough, all orders get 10% discount if these include one watch or 20% for two watches or more. Very tempting, isn’t it? The delivery for all orders to any part of the world is free by standard post office. You can also choose to get a 100% guarantee on Tax-free delivery by dispatching the shipment from UK, but only if you are in one of the EU countries- this option costs 25.00 USD for a package of 1-2 watches. The company claims that the delivery time is 7-10 business days and that all orders are insured for twice the amount of the watches purchased. Of course, if you have any special requests regarding your shipment you can contact the company to make them happen. As mentioned earlier, in the product description page it says for all replicas that the warranty time is 6 months. Still, on the Returns and Exchange page it states that these imitation watches come with a 12 months warranty. So which one is it? Of course, the repairs warranty covers only manufacturing defects. To request a refund or exchange you must contact the company within 7 days from the delivery and also ship it back before this return period expires. The problem is that the return fees will be paid by you, there is a 25% restocking fee and you will be charged a $25 shipping fee. Pictures: The pictures are very good and from what I can tell these are indeed owned by the company Replicahause.nl. Even though the quality is very high and the photographic style is very good, you can still see that the images are of the replica watches and not of the original products. All items have about 7 very clear photos that show the watches from all possible sides and illustrate all the markings, logos and numberings. From my point of view, this is a good example of excellent replica watches pictures, exactly the type of pictures that all replica companies should have for their imitation watches. Customer service: The company can be contacted by email, Skype and contact form. It does not have a contact phone number or a live chat service. The help button from the right side of the page is for sending an email message and not for chatting online. I find the Skype contact option interesting, but not very professional. I am not a fan of the more modern Skype, YMessanger or MSN contact methods because I find them highly unprofessional. I prefer a company that knows the value of a phone or a live chat as a direct method of keeping a contact with its customers. Summary: Replicagause.nl is an online replica company that pretty much manages to convince you that it is a trustworthy merchant. It does this by having a wide range of replica watches, decent prices, various payment methods, free fast delivery and very good product pictures. The only improvements it could bring to its services are regarding its return policy and the customer service channels it provides. Sells really low quality products. Bought a watch that came not functioning, sent it back($30 ups) for warranty and received the same piece, again not working. Complained and they claimed i dont know how to wind an automatic watch!!!? ?